View Cart “Guess How Much I Love Indiana” has been added to your cart. SKU: ZM61539. Categories: Childrens, Sports & Recreation. Tags: children, horseback riding, horses, learning. In Learning Horseback Riding, you will get to meet this little horse named Max. He will introduce you and your children to the entertaining sport of horseback riding. Learning Horseback Riding is written in a way that allows children to pick up the book and read it on their own. The fun illustrations in this book lend to easier and quicker learning. It includes interesting ideas and inquisitive puzzles. The kids are also given the opportunity to color some of the images. Your kids can also mark in the book and fill-in the blanks, which will aid in their understanding of horseback riding. Learning Horseback Riding is the ideal companion for those who are just starting out with their first riding lessons. You can find information on horse care, leading this large animal, and the various gaits of a horse. Little beginning riders are given all kinds of horse related information. How to practice and improve for moving in the saddle and, of course, how to sit in the seat are important facts that they will learn. But that’s not all. Inside this book is the rich history of horseback riding. 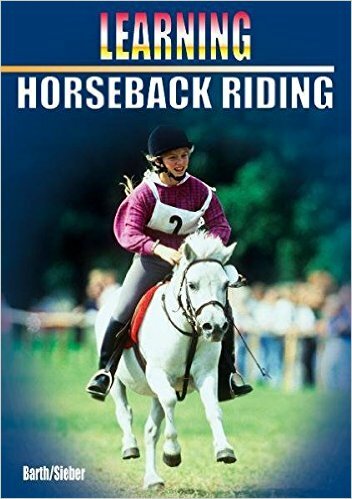 Also found are the various disciplines of riding, tips for equipment, and choosing the right club, which completes this delightful book for little horse lovers. All children who love horses will love Learning Horseback Riding. Katrin Barth is a teacher based in Lauf, Germany. She has over 10 years professional experience at the elementary and high school level. She has published the “Learning” and “Training” series geared toward elementary age children. Antonia Sieber is an elementary school teacher who is involved in horseback riding as a school sport. She has been riding since early childhood and is a certified riding instructor for amateur riders. Her home is based in Leipzig, Germany.